Little pictures of the hillside number 48. Will take a bit of a break from the series to work on some work for the Willow show that hangs the end of March and for the NWPS show that I need to get my entries in VERY SOON. Hay bales is a new miniature for the NWPS show. 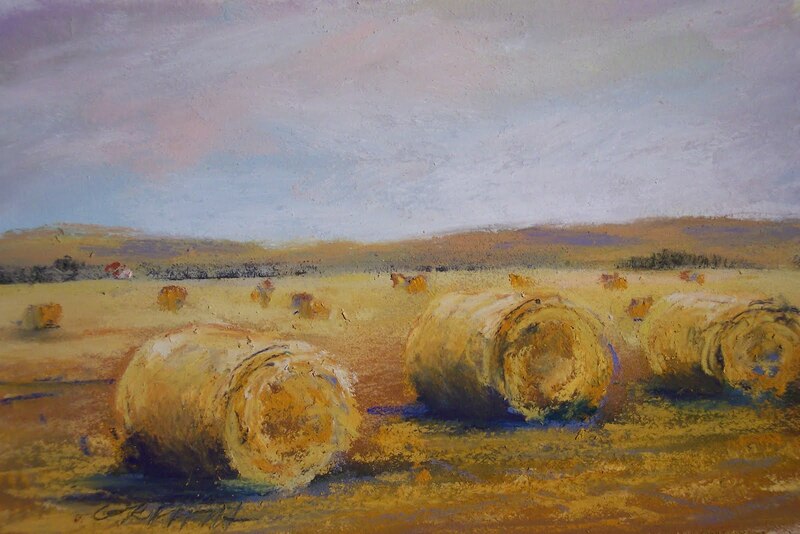 I have done other hay bale ones in miniature and I am liking them better as I do them. These are 4×6- or will fit in a 4×6 frame, so they are little drawings! I am reminded of a post from Diana – she says she wants to live in my Series of 100. That’s a huge compliment to know someone would like to live in place you are painting. I need to also post her last comments to the blog site, which I have neglected to do. New work schedule…no more retail banking! I will do mortgages again and paint more. I really am jumping up and down about this! Took me a long time to make the decision, but I did and it is good! This entry was posted on Wednesday, February 24th, 2010 at 9:55 pm	and posted in Uncategorized. You can follow any responses to this entry through the RSS 2.0 feed. Gallery Representation – thank you!